#AskanExpert: Will Income Based Repayment Affect My Husband’s Homeownership? Q. I have the regular student loans, and I have graduated. I’m married filing jointly and about to make my first standard payment of my student loan, but I am interested in applying for an income-based repayment (IBR) plan. My husband doesn’t have any student loans. My husband wants to apply for a mortgage in order to buy a home. But my question is, that since he needs to sign the IBR form, is his credit going to be hurt? Is his credit report going to show the balance of my student loan? Can I exit the IBR plan at any time? Is it better to stay on the standard payment while he applies for the home? Congratulations on the exciting prospect of buying a house with your husband. The first step toward homeownership is getting your finances in order to determine what kind of housing you can afford together. And I commend you for taking an additional step to explore your student loan repayment strategy in order to ensure you will be able to make your mortgage payments in the future. If your husband is applying for the mortgage by himself, only his debts and credit report will be reviewed on the mortgage application. Your loans and any credit that you have taken out on your own will not affect your husband unless he is a cosigner. With that in mind, you can rest assured that his credit won’t be affected when you sign for an income-based repayment plan and none of your student loan information will appear on his credit file. The only reason he is required to sign your IBR is because you are a married and filing your taxes together. This type of income-driven repayment plan uses the combined gross household income, that is your income plus your husband’s before taxes, to calculate your new student loan payment. Generally, you can change your IBR to any other income-driven plan at any time as long as you qualify. And to better address your question of whether you should stay on the standard plan or move forward with your IBR, it really depends on your overall financial situation and your combined income. I suggest that before you make a commitment to sign for an IBR, you talk to an NFCC certified credit counselor to explore additional income-driven repayment options such as Pay as You Earn (PAYE) or the Revised Pay As You Earn (REPAY). Under your IBR, your payment will be roughly 15% of your discretionary income while under REPAY it will be capped at 10%. The math can get tricky, so I recommended you use online calculators or talk to an expert to have a more realistic estimate of what your payments could be under each plan. As far as your husband applying for a mortgage on his own, he needs to get ready because lenders look beyond credit histories and credit scores. They will ask for your last tax returns and assess your husband’s risk based on all this information. And since he is applying on his own, only his income will be considered during the lending decision. If you were applying together, the income would increase, but then your credit and debts would be factored in as part of the decision, which could negatively impact his loan eligibility. 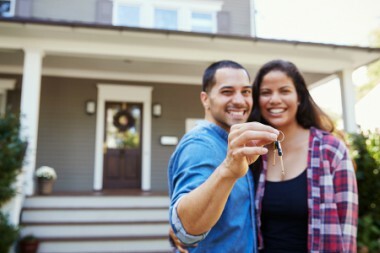 If you feel that you and your husband need additional assistance, there are plenty of resources and programs to help first time home buyers achieve the big dream of homeownership. Explore the resources in your community and the NFCC and get ready for one of the biggest investments in your life. Good luck! Bruce McClary is the vice president of marketing for the National Foundation for Credit Counseling. Based in Washington, D.C., he provides marketing and media relations support for the NFCC and its member agencies serving all 50 states and Puerto Rico. Bruce is considered a subject matter expert and interfaces with the national media, serving as a primary representative for the organization. He has been a featured financial expert for the nation’s top news outlets, including USA Today, MSNBC, NBC News, The New York Times, the Wall Street Journal, CNN, MarketWatch, Fox Business, and hundreds of local media outlets from coast to coast. If you have a question about your own specific financial situation, don’t hesitate to submit your question to our experts today!